8 Wired Brewing Co. | Beer Apprentice - Craft Beer News, Reviews, Interviews and Info. Hi guys. For today’s craft beer review I’m going to be trying the Saison Sauvin by 8 Wired Brewing Company located in Marlborough, New Zealand. If I understand correctly, 8 Wired is a fairly young brewery, so I’m very eager to see what kind of beers they produce. From the website, 8wired.co.nz, I was able to find this bit of information regarding the Saison Sauvin. Saisons have been around for ages. Traditionally brewed by Belgian and French farmers to provide refreshment during harvest. I’m guessing that flavour wasn’t a main concern back then; the priority was to provide a beverage that was safe to drink, because water usually wasn’t. Never the less, over time they developed a beverage chrarissed by beer geeks of the modern world. The alcohol content was low, so the workers could consume enough to keep hydrated and still perform their job: To load the barn with enough barley for next years brewing season. I bet these hardworking, humble farmers never imagined, that centuries later, their style of brewing would inspire brewers from all over the world. As all our beers, this is a very modern, you might say new world, interpretation of this style. Based on the tradition we have used a French Saison yeast, which provides a plethora of funky, earthy, very “Belgian” flavours. From there we have upped the ante a fair bit by doubling the amount of malt, and thereby the alcohol, and loaded the kettle with punchy Nelson Sauvin hops. Unlike the original, this is not a beer meant to be drunk by the gallon. Moderation is the key for full enjoyment of all great beers. This beer comes in a 16.9 oz. bottle and it has an ABV of 7.0%. It poured to a slight haze of pale orange with a white head that was sized nicely. The texture was soft, rocky and fluffy. The retention time was good, but the lacing looked loose and “gappy”. It fell back into the glass fairly quickly. The nose was very fruity, citrusy and hoppy. Solid doses of tropical fruits. Kiwi, mango and grapefruit. Some noticeable peppery spice blended well with some yeast and toasted breads. A hint of “funk” was found, but it was very, very, very light. Although, I do really like the aroma, it was a tad misleading. It wasn’t quite a typical Saison in my opinion. The funk was just too mild, but I did like the stronger hop profile though. The taste started with a slight tartness. Spicy with, again, only a small amount of “funk”. Like the bouquet, it was considerably hoppy and citrusy for this style. Tropical fruits of kiwi and grapefruit along with subtle hints of white grapes and even a touch of sour lemon. Towards the end the breads and yeast really helped “tie the room together”. The bitterness was welcomed and manageable. A very enjoyable taste to say the least. The mouthfeel was medium bodied with a very lively and prickly carbonation. Very dry, crisp, snappy and refreshing. A solid dose of flavor was left covering the palate long after the sip. We have a very nice beer here. I don’t know that I’ve ever had a Saison quite like this. It kind of reminded me of a Pale Ale only with more spice and yeast. It was a very enjoyable and fun drink. A very nice beer for the Summer season in my opinion. Very easy to drink and worth a try. I would like to find and try a few more from this brewery. Even though this beverage might not have been the best beer I’ve ever had I can tell that they take great pride in releasing a sturdy product. 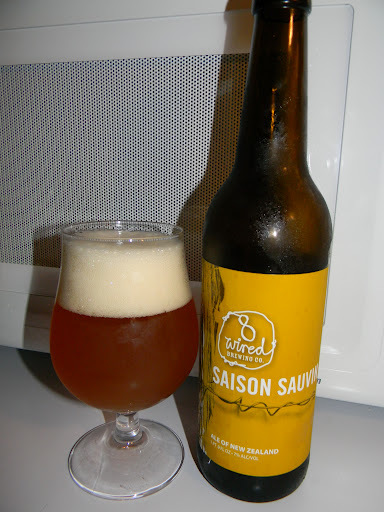 So, with that being said, give the 8 Wired Saison Sauvin a try and see what you think. Be sure to let me know your opinion also. Posted by Beer Apprentice on May 18, 2012 in 8 Wired Brewing Co., Country: New Zealand.